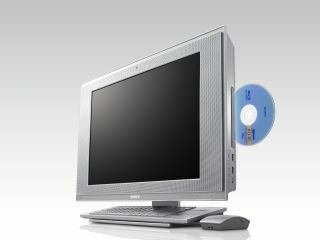 Sony has unveiled new desktop PCs aimed at the video and picture editing market, as well as pushing the PC further into the living room. The Vaio RT series is a huge 25.5in monitor that attempts to still be compact, by folding the keyboard away under the unit, which also houses the PC tower behind the screen too. One TB of hard disk space, courtesy of two 500GB drives, is backed up by an Intel Core 2 Quad CPU and 512MB NVIDIA GeForce9600M graphics. Unsurprisingly, the monitor comes in Full HD (1920 x 1080) for watching all those Blu-Rays the way Sony intended. As you might have guessed, this one has a built-in Blu-Ray read/write drive, an in-built subwoofer with Dolby processing, and HDMI inputs for a PS3, or another Blu-Ray player if one just isn't enough for you. Adobe Photoshop Lightroom and Adobe Photoshop Elements, plus Adobe Premiere Elements for HD and SD, are included in the package as well, so if you want to edit and save to Blu-Ray... well, this is probably right up your alley. These puppies are apparently designed for all-in-one entertainment, though come in a little smaller than the RT series. The LV series has a 24in (1920 x 1200) screen, while the LN has just a 20.1in (1680 x 1050) version... though that's hardly titchy for a computer screen. Both have an integrated digital and analogue tuner for watching TV and the Zero Angle feature means you can watch from near 180 degree range. The keyboard fits beneath the all-in-one unit, and an in-built pedestal conceals all cables. It will thus look like there are no wires, which may be interpreted as witchcraft and lead to your being banished from your village. You have been warned. The LV has a Blu-Ray burner, and an extra slot for another hard disk, and even allows hot swapping for those times when you fill up all 500GB, or whatever capacity you prefer. The LN has a DVD burning drive, which is surprising as it feels like Sony is saying 'What? DVD? No, that never existed... there's only ever been Blu-Ray...' while dangling a watch in front of the customer's face. And, once again, the HDMI slot for PS3 or whatever connection is present, as is an Intel Core Duo processor. No word on price as yet, but expect a hefty whack while Sony tries to shoehorn more tech into your inner sanctum.